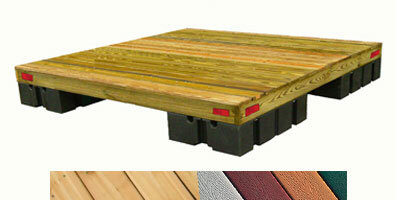 Winnipesaukee Island Services is one of New Hampshire's premium dock builder and dock service company. We install docks all across the Lakes Region of New Hampshire from aluminum crank out docks to sectional wooden framed docks. 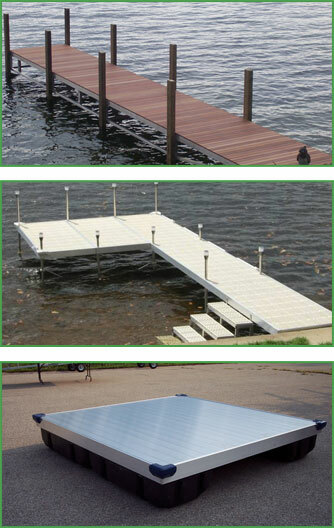 We sell the highest quality handcrafted aluminum docks built right here in the granite state for your specific needs. We guarantee spring dock installation dates and schedule dock removals after your boating season ends. We can help you obtain any necessary permitting and are always happy to answer your questions or provide you with a free quote. Do you have a question? Contact us today! This summer...escape...to the ISLAND swim raft...the perfect summer-long vacation for the kids, grandkids, or a relaxing vacation for any adult! 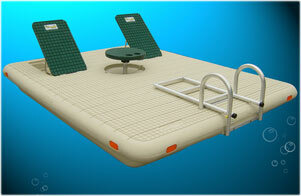 The ISLAND swim raft is loaded with incredible features such as Multi-Angle Back Rests and a Pop-Up Table. Delivery is available to the entire Lakes Region; please Contact us for a specific price to your location. We specialize in the design and installation of your new swim raft mooring systems. The price of installation varies due to depth, bottom conditions, and exposure, please Contact us for a free quote for your specific needs. Swim raft repairs, ladders, and covers. Swim raft mooring installation, inspection, and repair. Winnipesaukee Island Services specializes in the design and installation of individual mooring systems, mooring fields, and yearly maintenance and repair of your existing boat and swim raft moorings. We provide our mooring services to Lake Winnipesaukee, Lake Winnisquam, Squam and Little Squam Lake, Newfound Lake, Lake Wentworth, Merrymeeting Lake, and the entire Lakes Region of New Hampshire. We stock a full line of galvanized marine chain and hardware as well as a full line of stainless steel chain and hardware. Please Contact us today for a free estimate on any of your mooring service needs. Please include details about the location of your home, water depth, lake bottom conditions (i.e. : rocky, sandy, ect), exposure, type, and size of boat(s) that will be using the mooring. Every home owner and association has their own unique needs and requirements for their mooring system. 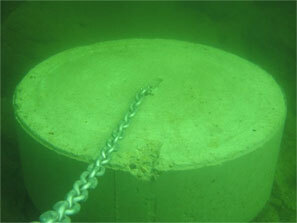 WIS will design a mooring system that is appropriate for your needs, location, and budget. Whether you're a home owner installing your first mooring, or you're an association with 30 moorings, we will work closely with you to accommodate your specific needs. Over time mooring components will corrode and wear out in marine environments. If your mooring has not been inspected regularly and you're considering putting a boat on it please Contact us to schedule an inspection. Our detailed mooring inspection will provide you with peace of mind knowing your boat is secure all summer long. Winnipesaukee Island Services stocks all the necessary hardware to keep your moorings in good working condition. We offer one time repairs as well as bi-annual service contracts. Your mooring is only as strong as its weakest link, and should be inspected regularly for wear and corrosion. Winnipesaukee Island Services is proud to offer bi-annual mooring service plans. Our mooring service plan is designed to keep your mooring functioning properly all season long. 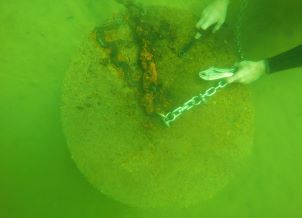 Our certified and experienced divers inspect your entire mooring system including the chain, hardware, and block each spring prior to installation of your buoy. We winterize your mooring chain in the fall and check your buoy and all of the upper hardware at the time of winterization for wear and corrosion. If we do discover any faulty mooring components we replace them at the time of inspection, we stock all of the necessary hardware on our mooring service barge so you will not experience any down time with your system. Our mooring service plan saves you money and gives you peace of mind knowing your mooring has been inspected at the beginning of the season. Early spring installation of your buoy. Inspection of your chain, block, and hardware. We stock all the necessary mooring hardware to repair your mooring on site to avoid any additional dive fees or down time. Fall buoy removal and winterization of chain. Please Contact us today for a free quote on a service plan for your mooring. Please Contact us today with your mooring permit questions.